SpaceX completed a Static Fire Test with its Falcon 9 rocket on Thursday in advance of the company’s second launch from Kennedy Space Center’s Launch Complex 39A involving the EchoStar-23 communications satellite. Thursday’s firing, delayed from Tuesday and Wednesday, served as a final test of the rocket and the pad’s ground systems ahead of launch day, currently targeting liftoff next Tuesday in a very congested range schedule for the prime launch site on the U.S. East Coast. An expendable Falcon 9 has become a seldom sight nowadays as SpaceX makes great strides recovering booster stages in support of the company’s re-use ambitions. 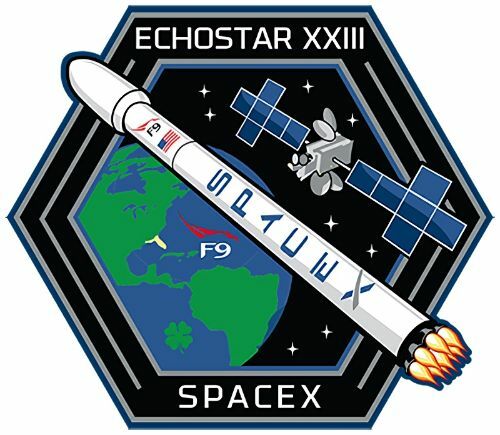 Such a rare beast, a legless Falcon 9, will be tasked with delivering the EchoStar-23 satellite to orbit in SpaceX’s next mission from the Cape. This will be one of the last expendable missions flown by SpaceX – no attempt will be made to recover the first stage booster which will continue on a ballistic arc after its role in the mission and find a watery grave in the Atlantic ocean. This is the first mission flown without the intention of recovering the first stage since the April 2015 flight with Turkmenistan’s first satellite. SpaceX may use the post-MECO flight of the first stage to assess how the core stage fares during a very high-velocity re-entry – potentially a valuable data gathering-exercise as Falcon Heavy’s central core is will be looking at a rather sporty entry for most of the rocket’s missions. 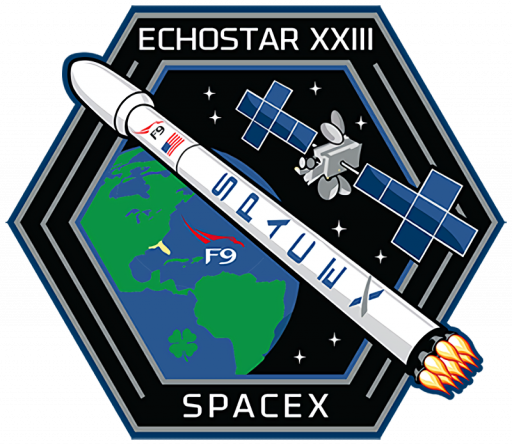 Built by Space Systems/Loral, EchoStar 23 weighs in at around 5.5 metric tons, aiming for a high-energy Geostationary Transfer Orbit – not allowing Falcon 9 to save propellants for the propulsive return of its first stage. Future missions of this nature will be handled by the Falcon 9 Block 5 version that implements the final performance boost expected over Falcon 9’s evolution while missions with even higher performance requirements will be flown by Falcon Heavy once it enters operation later this year. 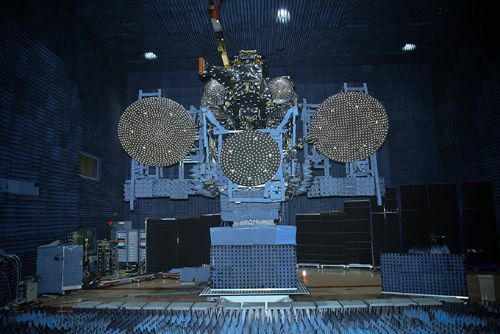 EchoStar 23 has been on SpaceX’s manifest for quite some time and is in somewhat of a hurry to reach orbit as its first operations phase is covered by a Brazilian government license that requires initial services from the satellite to start in the second quarter of 2017. The tri-band satellite has been designed to provide multi-mission capability, built to deliver services from any of eight different orbital slots – giving EchoStar a flexible tool to quickly respond to changing market demands by relocating the satellite’s capacity. Its communications payload hosts 32 Ku-Band transponders as well as Ka- and S-Band components. 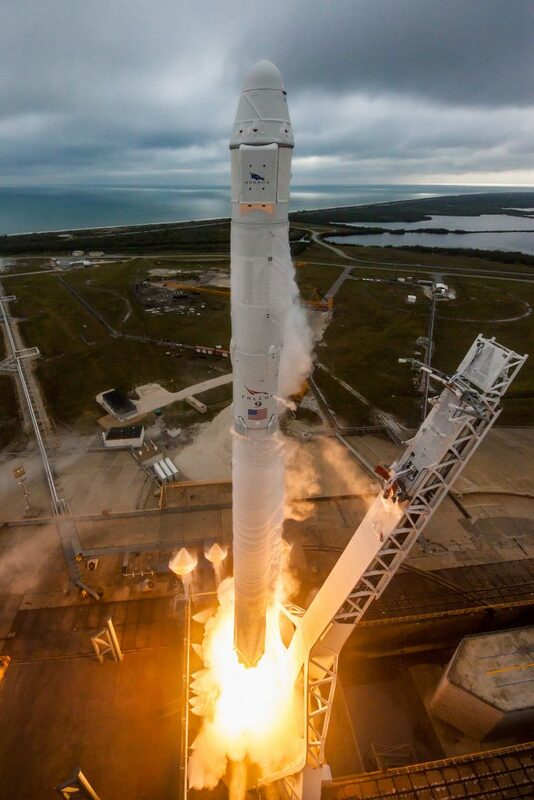 Launch Complex 39A supported its first SpaceX launch on February 19 when Falcon 9 thundered into low-hanging clouds with the Dragon SpX-10 spacecraft that has since arrived at the International Space Station on a critical resupply mission. 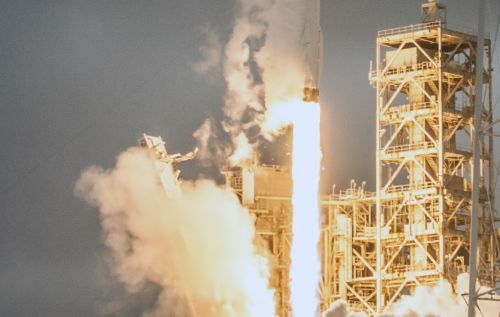 This launch marked the first uncrewed mission to take off from the famed LC-39A since Skylab’s launch in 1973 and the first overall launch from LC-39 in nearly six years following the Space Shuttle’s retirement in 2011. 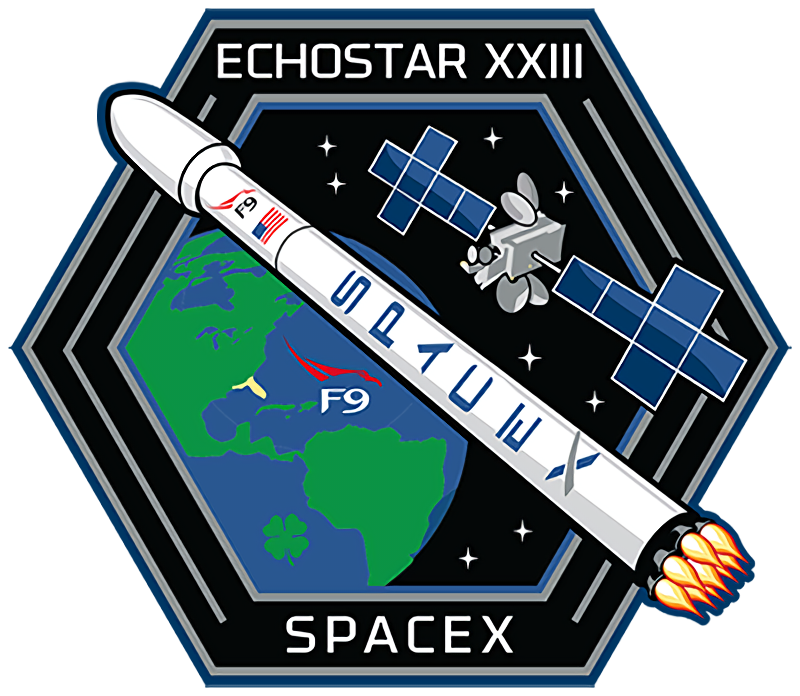 SpaceX had hoped the launch pad would receive a minimum of damage in its opening mission and had the range booked for the EchoStar 23 mission in late February or the first week of March. Inspections of the launch pad completed on February 21 showed that the pad held up fairly well but sustained damage to some fluid lines and wiring ducts. SpaceX decided to reinforce protection in critical areas to shorten future turnaround times, also looking forward to the Falcon Heavy rocket that will put the pad to the real test. 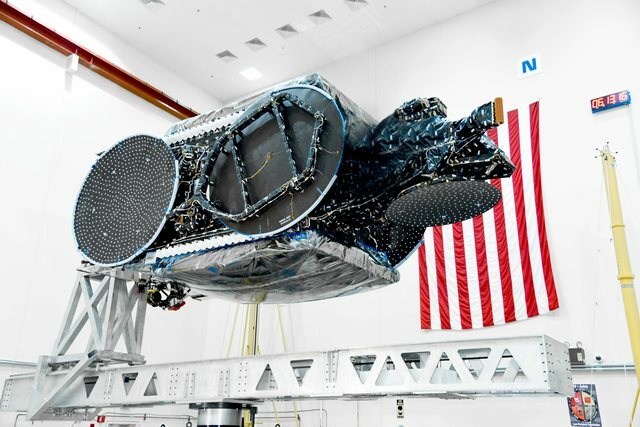 EchoStar 23 slipped to an NET March 12 target to facilitate work at the pad with the Static Fire scheduled for the 7th to provide sufficient time for the installation of the payload before returning to the pad for launch day. Falcon 9, sans payload fairing, indeed arrived at the pad on the 7th and was raised to a vertical position to prepare for the Static Fire, however, the day’s countdown never progressed inside T-70 minutes before the attempt was abandoned. Another try on Wednesday ended even earlier and engineers were spotted working on the rocket. 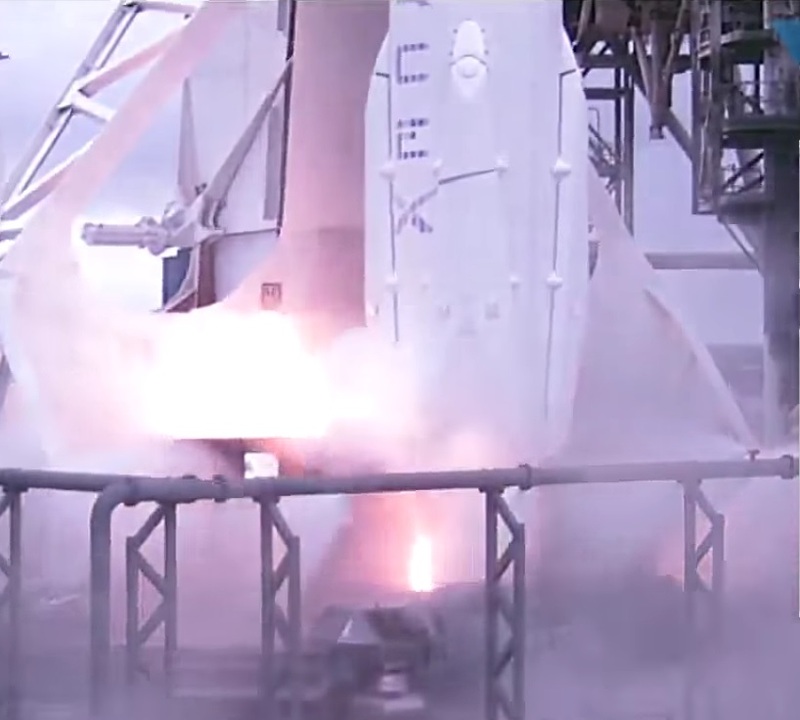 SpaceX sources said the company pushed the test for due diligence, citing mission assurance considerations. Signs were more positive on Thursday when Falcon 9 returned to its vertical position and venting of large clouds of oxygen showed propellant loading was imminent. Standing 57 meters tall with its fairing missing, Falcon 9 received over 500 metric tons of sub-cooled Liquid Oxygen and chilled Rocket Propellant 1 beginning 70 minutes prior to the test’s 23 UTC T-0 target, 6p.m. local time. SpaceX performed Static Fire tests for all of its launches to date, designed to put the integrated rocket and ground support equipment through an end-to-end test in order to discover any problems ahead of launch day. To that end, the test also involves the rocket’s second stage although it does not play an active role during the brief ignition of the nine Merlin 1D engines on the first stage. The final countdown sequence to the Static Fire is identical to that of launch day to put all components through the same flow they will experience – with an added safeguard to prevent the Hold-Down System from releasing the rocket after the engines ignite. In the last seven minutes of the count, Falcon 9 checked off dozens of steps to set up for ignition, just as it would with a payload attached, counting down to liftoff. Flames erupted from the launch pad right at the opening of the day’s test window as Falcon 9 soared to 694 metric-ton-force of thrust for a brief moment before commanding the first stage to shut down. Falcon 9 went through safing while engineering teams reviewed whether the Static Fire had reached its planned 3.5-second duration and all necessary performance data was captured. After this quick data review, Falcon 9 was planned to head into de-tanking to be able to return to the Horizontal Integration Facility (HIF) to meet its passenger. In-depth data reviews are completed leading up to the Launch Readiness Review to ensure Falcon 9 has a clean bill of health. Due to delays with the Static Fire, SpaceX has updated its launch target to March 14 with a 2.5-hour window opening at 5:34 UTC. United Launch Alliance announced an NET March 14 date for its Delta IV rocket carrying the WGS-9 military communications satellite after that mission slipped from a March 8 target, but apparently this date was not firmed up and SpaceX booked the range for Falcon 9. Nevertheless, Cape Canaveral is looking at an exceptionally busy time as three rockets currently stand assembled for liftoff. Falcon 9 is up first on March 14, Delta IV is currently in a holding pattern with an NET date of March 16 due to range requirements and Atlas V is standing ready for a nighttime liftoff on March 19/20 with the Cygnus OA-7 spacecraft, christened the SS John Glenn, headed to the Space Station for a cargo run. SpaceX hopes to establish a two-week launch cadence at Cape Canaveral after the EchoStar 23 mission to tackle a busy manifest. 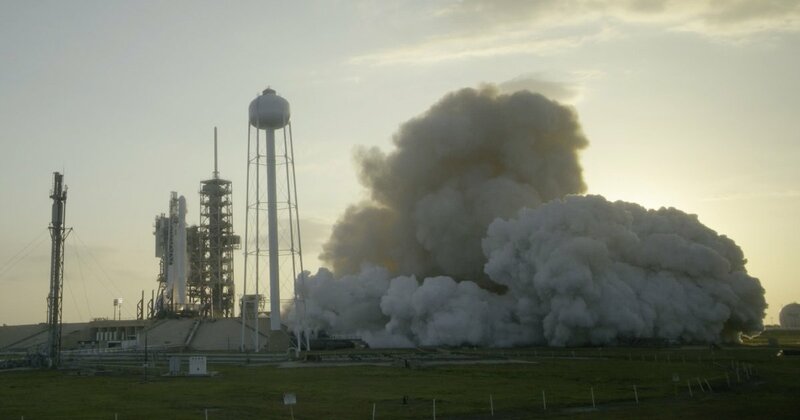 Space Launch Complex 40, damaged in the September 1st explosion of a Falcon 9, is expected to be returned to an operational configuration in the summer, allowing SpaceX to split its Cape manifest with ISS traffic and Falcon Heavy using LC-39A and commercial missions launching from SLC-40. The next mission on the manifest is SES-10 – another milestone for SpaceX’s reusability aspirations as the first re-flight of a booster that was already involved in an orbital delivery. The launch, currently tracking late March (at the earliest) will use the Falcon 9 Booster #1021 that became the first to successfully land on the company’s Autonomous Spaceport Drone Ship, homing in on the ocean-going vessel after dispatching the Dragon SpX-8 cargo craft on its way to orbit. SpaceX recently updated its manifest with two Cape launches expected in April, in line with the planned two-week cadence, and the next West Coast mission in June with the second delivery for Iridium, encountering a slip from an initial April target. SpaceX’s immediate focus is on dealing with a backlog of Falcon 9 missions; the debut of the Falcon Heavy is planned later this year after two months of outfitting work at LC-39A that will be completed once SLC-40 is back in action.